Finally, we have a challenger for the Warriors. It’s not the two-seed Denver Nuggets, who Golden State pushed aside in a comfortable 116-102 win in Oakland last night, nor is it anyone out East. The only guys that have been able to slow the Warriors freight train recently have been NBA officials, and they just added another psychological victory over the volatile defending champions. In the third quarter of Tuesday’s game, with Golden State up 20 and looking like an entirely different level of quality than the Nuggets, Kevin Durant complained loudly to referee Zach Zarba about what he deemed a missed foul by Denver’s Paul Millsap. That earned him a technical, as it often does (Durant has 16 techs this season), even as Warriors coach Steve Kerr tried to draw the technical himself to protect Durant. The jawing kept going, though, and so Zarba gave Durant a second technical in short order. After winning back-to-back titles, and three of the last four, and after losing eternal Finals foe LeBron James to Lakerland, it seemed like the Warriors were in cruise control for most of this season. Hell, they weren’t even the number one seed in the West for the most of the year, as Denver surprised everyone by keeping the top spot away from Golden State for much longer than expected. 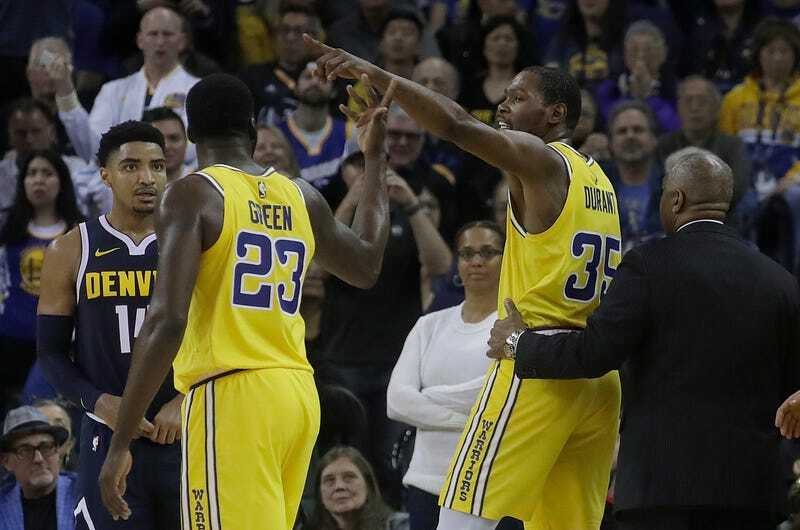 But whether by virtue of the playoffs being around the corner or because the reported in-fighting within the locker room and the even more reported plans for Durant to leave this summer have finally subsided, the Warriors have turned on their manic energy, and they have the refs in their sights.